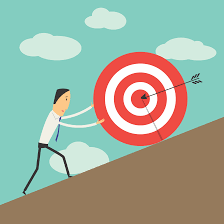 KPIs may be the most quoted lousy leadership tool in the book. They are lousy because they’re used the wrong way. The concept is powerful, both for redirecting company effort and to test new initiatives, among many benefits. Stand this checklist alongside your KPIs and see how you score. Answer yes or no. We have more than four KPIs for each major activity in the business. Our KPIs are mostly on internal processes. KPIs are designed by our financial team, because they’re numbers people. KPIs are available most weeks, usually by Wednesday. Our KPIs are primarily used by management. ▪ Any “Yes” answers mean that your KPIs are underperforming. SPEED BUMP: KPI design is too vital to be left to a smart young intern. Have three to four KPIs MAXIMUM. Three is better. Measure at the end of the process or at delivery to the customer. Earlier has limited impact. Design by the workers doing the job being measured. Use the finance folks to clear up the math and make data delivery reliable. KPIs are best if they track daily or weekly. Sooner is better, so it’s clear how we did and figure out how to do better. KPIs need to be simple, with the fewest calculations possible. Accuracy of 80 percent is okay. ACCELERANT: We have designed a quick KPI Assessment for you. 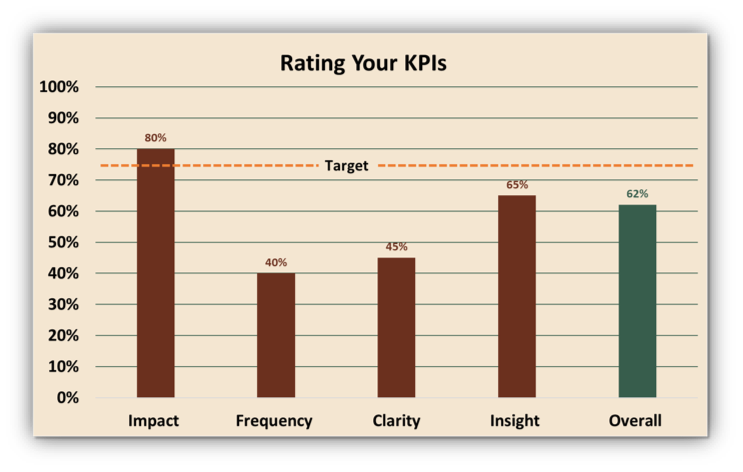 Thoughtfully answering 10 questions will measure how well your KPIs are performing in 4 important areas: Impact, Frequency, Clarity and Insight – providing a roadmap to improve how you use KPIs as a valuable business understanding tool. SPEED BUMP: If everyone in your organization doesn’t see them how can you expect everyone to help achieve them? KPIs are for workers, so that they can manage themselves, see ways to do better, and take pride in doing well. Your workers will believe in them when they see that responses to the KPIs improve their results. To reemphasize an earlier point, speed and simplicity trump accuracy People making the product don’t need KPIs to the last decimal point. They are making a product and need KPIs to help them make it better. Remember “Autonomy, Mastery, Purpose”? KPIs are the door to all three, if they are designed and delivered to help your workers. Management can peek, but principally to spot good results and hand out praise. Problems will become obvious (reported by your people, your quality system, your customers). Excellence is recognized less often, in spite of its reputation as a prime motivator. There. That wasn’t hard, was it? ACCELERANT: NOW will you clear the mud for your people and let them see the score every day?